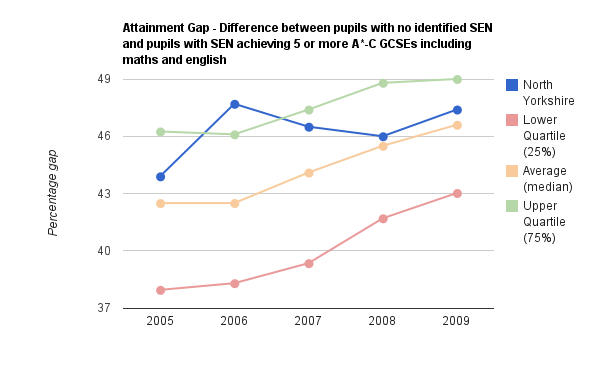 The graph shows the SEN attainment gap at Key Stage 4 (16 year olds taking GCSEs or equivalent). It compares the SEN gap in North Yorkshire to the gap across other local authorities. The best performing authorities have the smallest attainment gap using this measure, known as National Indicator 104. The upper and lower quartiles give an indication of how spread out the results are - that is 25% of authorities fall below the lower quartile, 50% fall below the average (median) and 75% fall below the upper quartile. 3 Why are the figures rising?